David Malpass, a conservative with longstanding ties to President Trump, has been nominated to run the World Bank, which he has criticized. President Trump has nominated Treasury Department official David Malpass, a vocal critic of the World Bank, to head the international financial institution. If approved by the countries that control the World Bank's governing board, which is considered likely, Malpass would replace Jim Yong Kim, who announced his resignation in January and stepped down before his term ended. Treasury Secretary Steven Mnuchin and the president's daughter, Ivanka Trump, led the search for Kim's successor and recommended Malpass. The Washington-based World Bank, which is controlled by the world's richest countries, lends money to emerging economies for infrastructure and development. Malpass has frequently complained about corruption and mismanagement at the agency. "The World Bank's biggest borrower is China. Well, China has plenty of resources, and it doesn't make sense to have money borrowed in the U.S., using the U.S. government guarantee, going into lending in China for a country that's gotten other resources and access to capital markets," he told the Council on Foreign Relations in November 2017. A senior administration official today said that other World Bank shareholders also support winding down lending to China because it has "substantial resources of its own." At Treasury, Malpass has pushed for reforms in how the World Bank operates. In December, he told a Senate committee that the institution had committed to making "meaningful reforms." 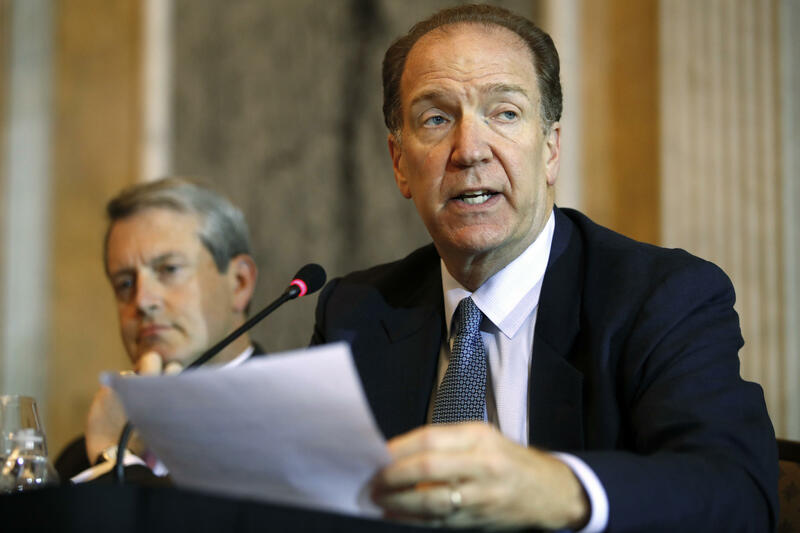 "David Malpass would be a disastrous, toxic choice for World Bank president," tweeted Tony Fratto, who served in the Treasury Department under President George W. Bush. But it's not clear whether the controversy is enough to derail the appointment of Malpass. While the World Bank board must approve the president, it traditionally defers to the U.S. over the appointment. One World Bank official who asked not to be named said it wasn't certain whether member countries have the stomach to oppose the Trump administration on the issue. Though President Trump often has expressed skepticism and even disdain for international institutions, the administration surprised many by supporting a funding increase for the World Bank last year. A senior administration official said Malpass worked with Mnuchin to back the funding increase, tying it to "significant reforms that will deliver much needed help to developing countries." Today President Trump nominated a longtime critic of the World Bank to be its next leader. Conservative economist David Malpass is now a top official at the Treasury Department. His nomination is already generating controversy, but the Bank's board is expected to approve it. NPR's Jim Zarroli reports. JIM ZARROLI, BYLINE: David Malpass was chosen after a long search process overseen by Treasury Secretary Steve Mnuchin and the president's daughter Ivanka. With Malpass, they ended up choosing somebody already well-known to Trump. PRESIDENT DONALD TRUMP: He's been with me for a long time. He's been a supporter for a long time, a supporter in a financial sense. Even before I ran, he liked the job I did. I like those people somehow. ZARROLI: The two men have known each other since their days in New York. Malpass was chief economist at Bear Stearns, the investment bank that crashed and burned during the financial crisis. He later started an economic forecasting firm. Before that, he served in the Reagan and George H.W. Bush administrations. Malpass has long been a vocal critic of the World Bank. The Bank has 189 member countries with a mission to reduce poverty in developing nations. It lends out tens of billions of dollars a year for things such as power plants and factories. The loans are guaranteed by the U.S. and other member countries, and Malpass has complained that much of the money goes to places that don't need it, like China. DAVID MALPASS: And it doesn't make sense to have money borrowed in the U.S. using the U.S. government guarantee going into lending in China for a country that's got other resources and access to capital markets. ZARROLI: Malpass has promised to bring what the administration calls pro-growth reform to the World Bank. His nomination was immediately criticized by those who see him as hostile to the Bank's mission. Tony Fratto, who served in the George W. Bush administration, says Malpass' nomination is toxic. TONY FRATTO: You can scour David Malpass' background for any interests in, you know, alleviating poverty and working on development strategies, and you won't find anything. ZARROLI: Whether the critics can do anything about the appointment is unclear. Malpass' nomination has to be approved by the World Bank's board, which can in theory appoint someone else. But Charles Kenny, a former World Bank employee now with the Center for Global Development, says the board has always deferred to the United States on who gets named president. CHARLES KENNY: The rest of the world and the United States are finding lots to disagree on at the moment. I guess in the grand scheme of things, who gets to run the World Bank isn't, you know, top of the list of issues to add to that growing list (laughter). ZARROLI: One World Bank official who didn't want to be named noted that in the Treasury Department, Malpass had overseen a big injection of money to the World Bank last year. That indicates he may not be as hostile to the Bank as his past rhetoric suggests. Jim Zarroli, NPR News, New York. (SOUNDBITE OF SHIGETO'S SONG, "DETROIT PART II") Transcript provided by NPR, Copyright NPR.